Is Your Email Address Vulnerable to Spammers? It can be maddening when your email inbox gets a fresh load of spam dumped into it. Equally frustrating is when spammers spoof your address as the sender, and your friends all start asking why YOU are sending them unwanted sales pitches for dubious products. Understanding how spammers get your email address can help to prevent both of these problems. Using web-crawling "spider" programs (not unlike the ones Google uses to index Web pages) spammers hunt down email addresses by looking for the telltale "@" symbol. Working swiftly and ceaselessly, spiders can harvest millions of email addresses automatically. To avoid being "bitten" by an email harvesting spider, don't put your email address on public spaces on the Web. That means not posting it to online forums or personal web pages. If it's included in online directories (school, work, clubs, etc.) ask to have it removed. Do a Google search to see where your email address is available, and work towards becoming invisible. (Tip: enter your email address in the Google search box enclosed in double quotes.) If you must make your email address visible in public, you can obscure your address by avoiding the "@" symbol, i.e., use "joe at blow dot com" instead, or create an image with the address instead. "Dictionary attacks" are another standard way to collect email addresses. Spammers generate emails to made-up addresses, accepting millions of bounce-backs in exchange for a handful of replies from valid addresses. That's why the first rule of dealing with spam is "don't reply to it." Doing so just tells the spammer that you are a "live one" and worth hitting with more spam. You can make it harder for a dictionary attacker to guess your address by NOT choosing any combination of dictionary words, common first or last names, and a string of numbers. If your email address is jsmith123@aol.com or susie90210@hollywood.com I can guarantee that you'll get loads of spam, no matter how careful you are. Those addresses are just easy targets, because they're so easy to guess. With apologies to Jimmy Buffett, some people claim that there's a hacker to blame, but you know, it's your own damn fault sometimes. Many people simply hand over their email addresses, no questions asked, just to get access to a contest, some free program, a ringtone, or other supposed "valuable prize." It's a good idea to have a "throwaway" email address that you can enter into Web forms, rather than using your everyday address. See my related article Fight Spam With a Disposable Email Address for more tips on how to protect your inbox. And if you have an email password that's easily guessable, spammers may hack into the email account and steal all of the contacts stored there. If your computer is not adequately protected from viruses, spyware and phishing attacks, all of the people in your email address book are vulnerable to spam attacks as well. See my article Here's the END of Weak Passwords for help picking a secure password. I'm pretty sure that email "forwards" play into the hands of spammers, because they accumulate a large number of addresses as the message spreads from one person to another. For a while, I wasn't sure how this worked, because I didn't see an easy mechanism for those bloated messages to wind up in the hands of the the spammer. But then I realized that if even one of those recipients had their email hacked (or computer compromised by malware), the entire trove or addresses would be vulnerable. This may or may not be a major source of email address harvesting, but at the very least, you must agree that blindly forwarding every silly story doesn't contribute anything positive to the Internet. Cambodian midgets fighting lions? Nigerian prince wants your help transferring money? Really?? If you're tempted to forward something that seems dubious, check it out on Snopes before hitting the Send button. If you don't trust Snopes, use another myth-busting site such as Hoax-Slayer or TruthOrFiction. Along those lines, I cringe whenever I get an email that includes my address, along with dozens of others, in the TO: or CC: line. It's especially irksome when they come from businesses who should know better. In addition to revealing their customer/contact lists to everyone else in the distribution list, it's really bad form. Hacking into a major company's databases can yield millions of high-quality email addresses at once, not to mention even more valuable data such as credit card numbers, Social Security Numbers, etc. In December 2016, Yahoo confessed that over one BILLION of its users’ accounts had been hacked three years prior. Target, Chase Bank, American Express, Home Depot, Apple, Sony and other large companies have reported hacks in the past 2 years, resulting in many millions of accounts being compromised. The Big Kahuna of Data Breaches was reported in September 2017. The Equifax hack was especially damaging, because it revealed names, addresses, Social Security Numbers, birth dates, driver’s license data, credit card numbers, and email addresses. By combining all of that data, Bad Guys can create much more sophisticated and compelling email scams. See my article Which Privacy Tools Do You Need (and which should be avoided)? for some tips on how to protect your privacy in the age of constant data breaches. Spammers also trade in lists of email addresses. A list of a million addresses goes for as little as $100. Some online crooks don't even mail spam, but make their living harvesting and trading email addresses. It's almost impossible to hide your email address from spammers completely. At the least, you'll probably get a blind dictionary attack spam, eventually. But think before you give your email address to any website. The fewer entities that have your email address, the less spam you will receive. Using a disposable email address, keeping your own computer secured, and encouraging your friends and family to do likewise will also help. Most recent comments on "Spammer Got Your Email Address? (here's how...)"
Hint: If you have to sign up for something "free" with your email address, its quite likely that those "trusted partners" are going to spam you and so will their "trusted partners". That's how "free" gets monetized. Using Blind Carbon Copy (BCC) to send mail to a number of people will help minimize address leakage, thus potentially sparing your contacts, especially if its a message likely to get forwarded. Ha ha I had to give my email to comment here -- Just joking, Bob. I know you are OK. Excellent article. Since my email was supposedly found on the Dark Web and my life has been plagued with a ridiculous number of inbox spam, I would like to know how to get rid of this very annoying problem after the fact. My primary email has been used since I signed up for my major provider many years ago. I could switch over to my other email provider but to change my primary on websites would entail a huge amount of time. And then it may end up the same way. I could start using my alternate email provider instead which hasn't (to date) received any spam. Any suggestions would be appreciated. P.S. It is easy to tell if an email is from, for instance, Amazon by hovering the cursor over the sender. Usually by the address it is obvious it is spam. After all, Amazon doesn't send notices via, for instance, Germany or Japan. Although these spammers can mimic a sender address, in my experience most don't even bother. I use "evil" Gmail and virtually never see spam and the times I go through the folder to see if I am missing anything from a legitimate source it is pretty much never anything I need to see- almost always some sort of promotion that I did sign up for. SharonH: A suggestion - Create a new Gmail account which will become your primary email. On the old account (which was used too many places to easily change) change the 'Auto forward' setting, if available, to automatically forward all incoming email to the new Gmail account. Alternatively, you can have Gmail automatically retrieve your email from the old account; that setting can be found in GMail at Email, Settings, Accounts and import, Check mail from other accounts. In either case, you'll be using the new Gmail account but be seeing incoming mail from both new and old accounts. And Gmail will be using it's excellent spam filters on both accounts. I have 3 email accounts from my internet service provider. I get spam less than once a year through these. My first email account was an MSN account. Virtually ALL of my spam came through this one: Canadian drugs, sexual offers, etc. In my opinion, Microsoft's spam filters seem to be almost non-existent. I closed the MSN account. There is no way that enough information can be published on this subject, especially if the particular subject is bank fraud. That is where the big bucks are for these useless slimeballs. I'm not proud to say that I got hit, probably due to my own carelessness, but it happened. You cannot be too careful. A phone call from the fraud division of your bank at 11:00 pm will tend to make you a lot more cautious....especially when it applies to considerable money!! What really pisses me off is when a bank or other agency takes a "so what, what can we do?" attitude when ever you report a fraud or suspicious e-mails etc. Heads up folks...don't take this casually. Thank you for Vivaldi suggestion..spam dropped a lot! I also learned not to open spam, since that DOES let the sender know you are alive and well. I also do not fill out 'reviews' on purchases. I was shocked when I Googled my name, and found my minutes as a secretary of a flying club on line!! Thanks for your help to us!! And for VERY useful tools, I believe you mentioned this in an earlier article, are the services that allow you to create a new unique e-mail address for each contact. I use sneakemail.com but I'm sure there are others. I have no association with them other than to make use of their service over 5 years. They create a unique address for each sender which forwards things to my "real" address, and you can set mail filters with each virtual address, or deactivate or delete any of the generated addresses. If you reply to one of the messages, it goes through their process that replaces your "real" address with their virtual address. I think their current price is $3 a month. Thanks for the help! I have to do something because it has become a real pain in the ***. So there is hope after all. First I don't answer any sender I don't recognize, trash it. Also I hover on the sender to see if it's legit. 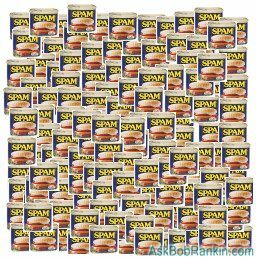 Been using a personal computer (at home)since '99'don't git much spam any more since I started deleting the spam.